Baan Piam Mongkhon. 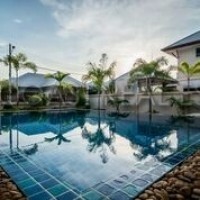 This new small private village located just out of the city in Huay Yai district is offering very large, modern,trendy homes, built to a high standard with good quality materials. There are a number of different house types to choose, to suit everyone\'s personal taste, and budget. Offering 3-4 bedroom homes, all with private off road parking, landscaped gardens, UPVC windows and doors, high quality built in furniture, and bathrooms, mostly with private swimming pools, and jacuzzi. Great for anyone looking for a nice residence in a new family village.